Flåvær is a traditional fishing hamlet and trading post situated at the entrance to Herøyfjord between the islands of Gurskøya and Bergsøy to the north. The sea conditions can be very tough in this area, but the harbour here provides shelter in rough weather. It has also been used as a place at which to wait for suitable conditions to sail south across the often treacherous stretch of water round the Stad headland. Excerpt from a diary kept onboard “Falken” 1869. By Carl Frederik Diriks, Director of the Lighthouse Authority 1855-81, HERØ and FLAAVÆR trading posts. 27th June,…Just as Sælø and Silden are points of departure and places to lie in wait for fine weather south of Stad, so are Herø and Flaavær the same to the north. The owner of Flaavær (Gerhard Nilsson Wiig) told me that when he moved there in 1841, there were no mooring points, so vessels seldom lay in wait there, while Herø harbour could often be crammed full. A couple of years later, mooring points were established at Flaavær, from which time the harbour has been used frequently. Flaavær lies way out towards the open sea, where breakers and currents are rarely calm. Perhaps the name comes from frod or fraud, which means froth. It is also possible that the syllable flå means flat, since the islets are flat compared to high mountains on the islands surrounding Flåvær, which is actually a cluster of small islets running from west to east. Farthest west stands Flåvær Lighthouse, then comes Varholmen, Husholmen, Flåvær itself and farthest east Torvholmen. Due north of this row of islets lie the island of Sandøya and several smaller islets and skerries, and it is between these that Flåvær harbour is situated. The approach from the north is marked by two old cairns. All around on the rocks there are many mooring points. They are well maintained and clearly visible. Flåvær has been known and used as a harbour since way back. If you did not sail in Vanylvengapet, this was the first harbour that offered shelter after crossing Stadhavet. In the summer when it was light all night and in good weather, ships could often sail the outer fairway north of the Stad headland. Then they would not make landfall until Giskesundet. In bad weather when darkness fell early, Flåvær harbour was frequently used. Both Sunnmørs and Nordlands jekts (open sailing vessel rigged with a square sail, historically used a freighter along the coast of Norway) lay here waiting for fair winds to and from Bergen. It was often a very long wait, which is why the harbour was given the nickname Pinebenken (the rack) by seafarers. This old fishing hamlet was often the refuge for many fishermen from the fjords and inland villages when they were involved in the winter cod fisheries. There would have been small fishermen’s cabins, many slept in wharfside sheds and warehouses. Some might also stay with the Flåvær inhabitants in their homes. Fishermen frequented Flåvær until long into the 1930s, because it was a convenient place with but a short row out to the fishing grounds. During the herring fisheries winter or summer, many fish buyers would moor in the harbour with their jekts and other small boats and salt the fish. Then there would masses of people busy slaughtering and salting, both onboard and on land. 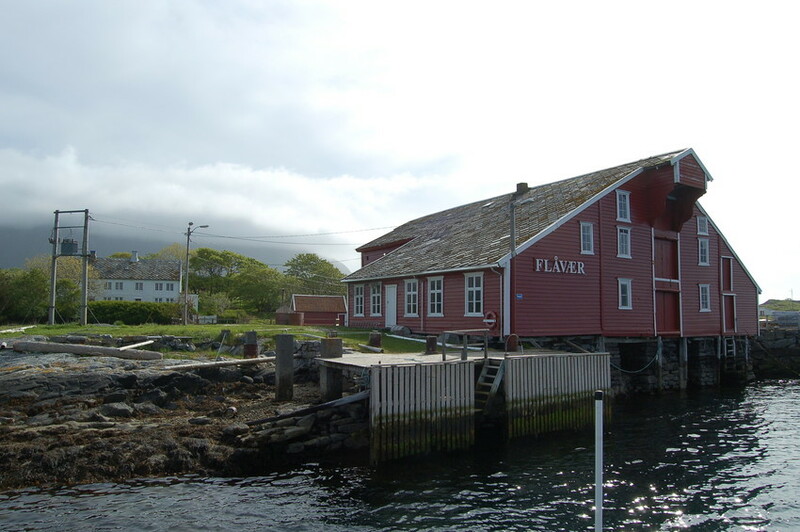 Flåvær has been a trading post and provided accommodation from the mid-17th century up to around 1920. Only for very short periods of time has this trading been interrupted. Families that have been involved in trading from Flåvær are, Grot, Wiingaard, Schultz, Schjelderup. Schjelderup had his trading post on Kriksholmen. In the late 18th century, Christoffer Rønneberg from Kriksholmen owned the island.